Thread: 3/0 Thread (color to match body). Eye: 7/32 Spirit River Dazl Eyes. 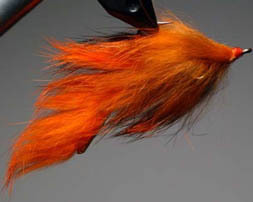 Tail: Straight cut rabbit strip 1 1/2 times the hooks shank in orange, white or black. Body: Cross cut rabbit strip. 1. Tie on the 7/32 Dazl Eyes above the hook point. of the hook to the bend. 3. Cut a 1″ length of 20# mono and tie down on one side behind the eyes. point forming a mono loop. palmering the rabbit strip down the shank overlapping the previous wrap. Tie down the rabbit strip one half eye length from the hook’s eye. 5. Super glue the thread.